Look for promotional packs of Kellogg's cereal and snacks, including Rice Krispies, Frosties, Crunchy Nut and Squares (norm £2ish-£4ish at most supermarkets), to get 'free' adult entry via a voucher for 30 Merlin attractions until 30 June 2020. Effectively this is a 2for1, as you must buy a full-price on-the-gate child or adult ticket to get the free adult entry, but this could actually work out better than a 2for1 ticket if you're an adult going with a child as generally child tickets tend to be cheaper than adult ones. The vouchers can be exchanged for entry on the day at Merlin attractions including Legoland, Alton Towers, Thorpe Park, Chessington, Sea Life centres and sanctuaries, the Dungeons and Madame Tussauds. Some dates are excluded and these vary between attractions - see 'More info' below. Promotional packs will be readily available in stores until May, after which they'll be harder to find. How strong is this deal? While attraction prices vary, the most you could save with this offer is £57ish based on peak Legoland Windsor ticket prices (norm £60 each on the gate, so £120 for two, but you could get two for £63ish with this deal). As it covers a large range of attractions and the vouchers are valid for over a year, this is a particularly strong deal if you and one other person are considering visiting one of the participating venues. However, if you’re only interested in visiting a specific attraction, possibly more than once, and aren’t going in a pair, it’s worth checking to see what other deals are available. Find ticket prices for other attractions and see our round-up of theme park deals to check which works best for you. To guarantee entry and beat the queues at selected attractions, there's also an option to book your tickets online in advance using unique codes found inside Kellogg's cereal packets (though you'll still pay the on-the-gate price). Technically, these codes can be combined with the physical vouchers to obtain two free adult tickets with two full-price child tickets purchased - see 'More info' for full details. Ensure you take the voucher with you on the day. It can only be used against the gate price, not the discounted online price. The age classification for an adult ticket varies between attractions so make sure you check before you go. Valid for standard entry tickets only. Promotional vouchers aren't valid at secondary attractions and don’t guarantee entry into attractions in the event of venue capacity being reached. Offer can't be used with any other offer or concession, reward or loyalty schemes. To guarantee entry in advance, you can book tickets online (excludes The Blackpool Tower Circus) at a special Merlin website ahead of your visit. To do this, you need a unique code found inside promotional packs of Kellogg’s cereal only, on the underside of the carton flap. This method of redeeming the offer requires you to pay the gate price in advance and print out your tickets. At selected attractions, you can scan these tickets and walk right through the gates, enabling you to beat the queues. If you want to add some snap, crackle and pop to your Christmas countdown, you can get a Kellogg's advent calendar for £4 in store at Tesco (find your nearest*), while stock lasts. What does the advent calendar contain? 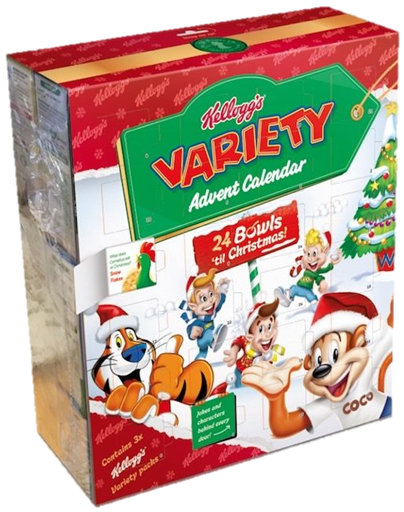 You get three Kellogg's Variety eight-packs, meaning a total of 24 single-serving Kellogg's cereal boxes including Coco Pops (30g), Frosties (25g), Rice Krispies (20g) and Corn Flakes (17g), with each advent door including a Kellogg's character and message showing which cereal to eat. As this contains three eight-pack Kellogg's Variety boxes, that works out at £1.33 per pack. They're normally £2.05 bought individually at Tesco*, and the cheapest we’ve found one pack is £2 at Asda* and Iceland*. So if you usually buy these Variety packs anyway, then it's actually cheaper to get them with the advent calendar. What other advent calendars are available? See our Quirky advent calendars blog including wine, cheese, Baileys and Pringles calendars. If you want to add some snap, crackle and pop to your Christmas countdown, you can get a Kellogg's advent calendar for £8.99 in store at B&M (find your nearest), while stock lasts. You get 24 cereal bars, made up of six 20g Coco Pops, six 25g Frosties, six 20g Rice Krispies, three 36g Rice Krispies Squares caramel & chocolate, and three 36g Rice Krispies Squares chocolatey, plus two 50g Pop Tarts strawberry. When we checked on Mon 22 Oct, we found we could buy the contents of the advent calendar separately at the major supermarkets for between £5 and £10, depending on the supermarket. So while the advent calendar is a little cheaper than the most expensive supermarket price, the contents can be bought for about 44% cheaper without the advent box, so we wouldn't exactly call this cerealously good value.